Suzhou DHT Elevator Co., Ltd. is a professional elevator manufacturer that integrates the research, development, sales, installation, repair and maintenance into one. The company passes ISO9001: 2000 quality system certification. We supply villa elevator, passenger elevator, observation elevator, bed elevator, automobile elevator, freight elevator, hydraulic elevator, escalator, moving walk. If you need, please contact us. A dumbwaiter lift is a small freight elevator that moves goods between building floors. We are a professional dumbwaiter lift manufacturer in China. 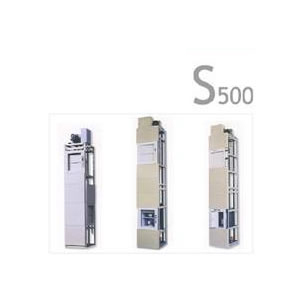 Our S500 dumbwaiter is of unique design, and adopts international standard angel and square tubes for frame structure. The main guide rails use cold-drawing T-shape guide rails, and the door slideway is made by special aluminum material. Thanks to its reasonable mechanical driving design and high quality traction machine, our dumbwaiter lift is more reliable and safe. Besides, the lift adopts PLC computer control for excellent operation and strong anti-interference performance. VVVF frequency control drive further guarantees the operation stability and the accuracy of being leveled with floor so as to increase the efficiency. Moreover, the S500 dumbwaiter lift has automatic fault display function, which facilitates the installation and maintenance of our lifts. Suzhou DHT Elevator is an experienced manufacturer of dumbwaiter lifts in China. We mainly specialize in the production of goods elevators, villa elevators, panoramic elevators, and so on. As a result of their superior quality and competitive prices, our elevators are sought after by customers in Philippines, Bangladesh, Uzbekistan, Saudi Arabia, Albania, Russia, Nigeria, South Africa, India, and more. We are looking forward to cooperating with more global customers. We are confident that you will be satisfied with our products.